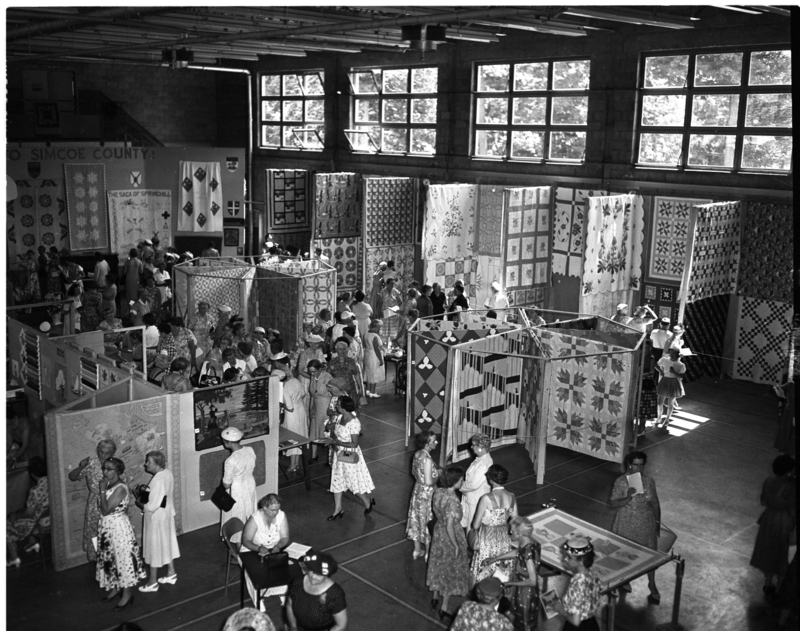 Click on photos to enlarge; A panoramic view of the Midland Armory during last week’s quilt and rug fair gives readers an idea of the attractive arrangement of the 150 quilts and 75 rugs which were on show. Quilts appear to be as varied in design as they were in number. There was plenty to interest the record number of visitors who took in the tenth annual quilt and rug fair at Midland Armory last week. 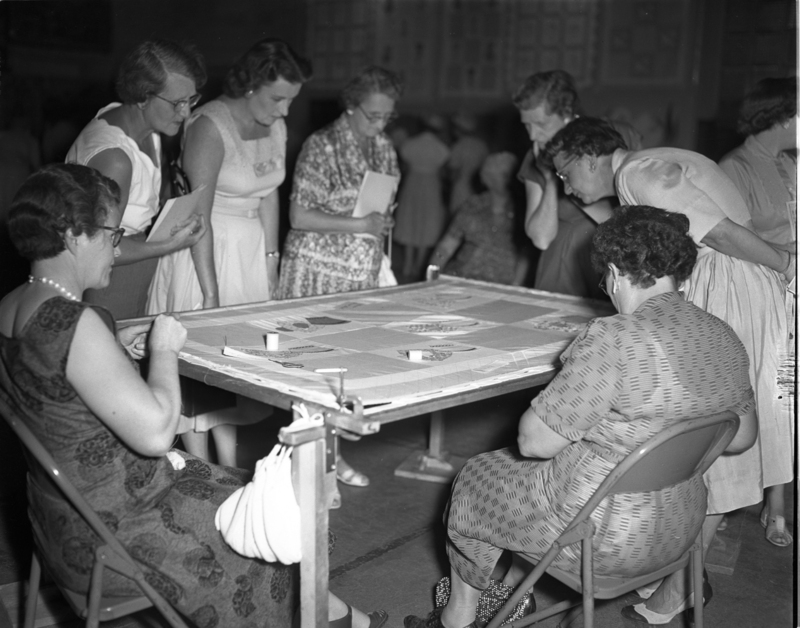 Quilting demonstration by Mrs. Newton Brown and Mrs. Mervyn Edwards of Vasey always had a good audience. 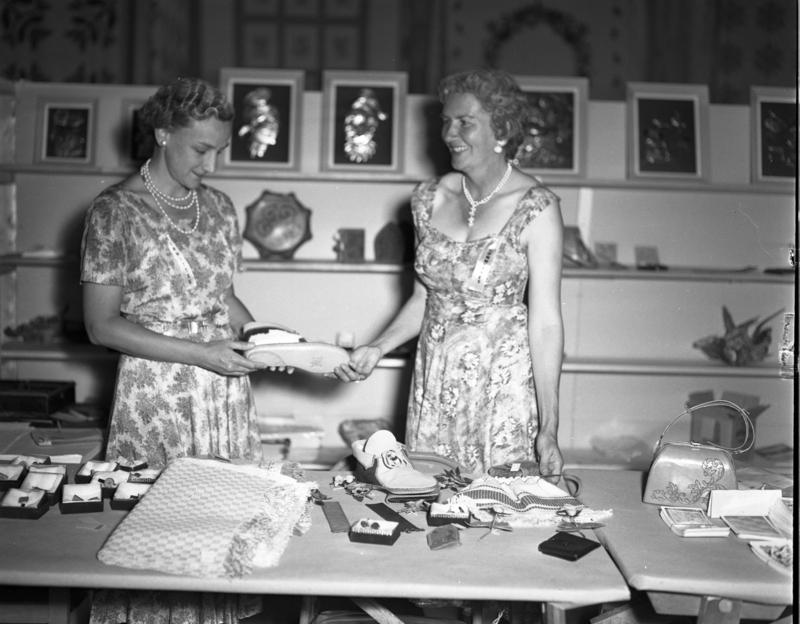 Miss Margaret Robinson and Mrs. Fred Cook look over a number of handicraft exhibits. 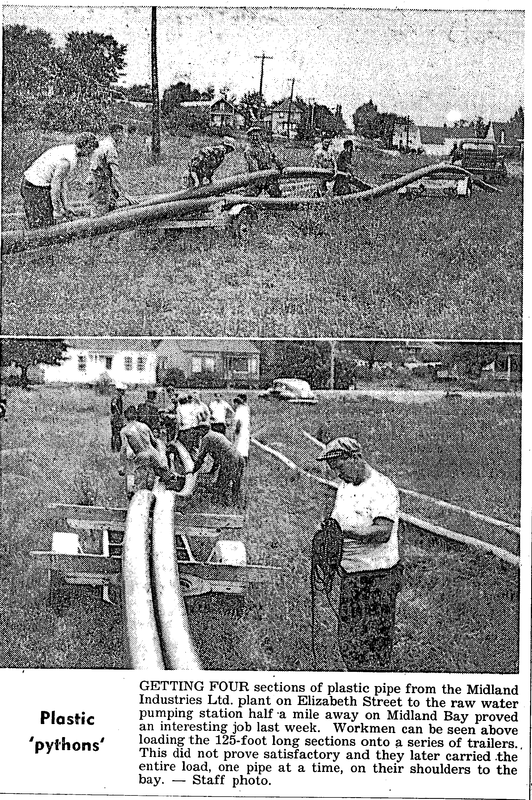 The Huron Indian Village is featured on the front covers of the 41,000 Bell Telephone directories for 1958, now being distributed in the Midland, Barrie, and Collingwood areas. 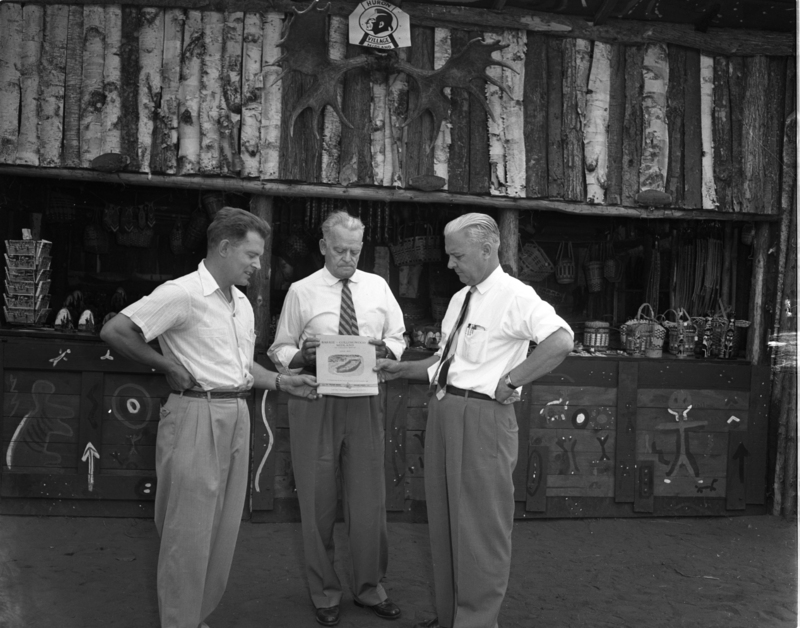 Bell’s Midland manager, H. Kilroy, center, displays the first copy to Frank Bray and Tom M. McCullough of the Y’s Men’s Club, which built the popular attraction. First drowning victim at Tiny Township beaches this season, nine-year-old John Mangos of Toronto lost his life at Balm Beach July 25, unseen by a large group of bathers. The first intimation of the tragedy came when John Craig, a cottager, stepped on the boy’s body as he was leaving the water after a swim. Mr. Craig picked up the boy from the bottom of the comparatively shallow water and brought him to shore. Although a group of volunteers immediately commenced artificial respiration, along with assistance from Midland Fire Department’s resuscitator, they were unsuccessful in their two-hour struggle to revive the lad. Once the site of a busy sawmill in the heyday of the lumbering industry around the south end of Georgian Bay, Tannerville has in recent years blossomed into the site of many fine cottages at what is now called Tanner’s Beach. A fish-eye view of some of the cottages taken from the lakeside. 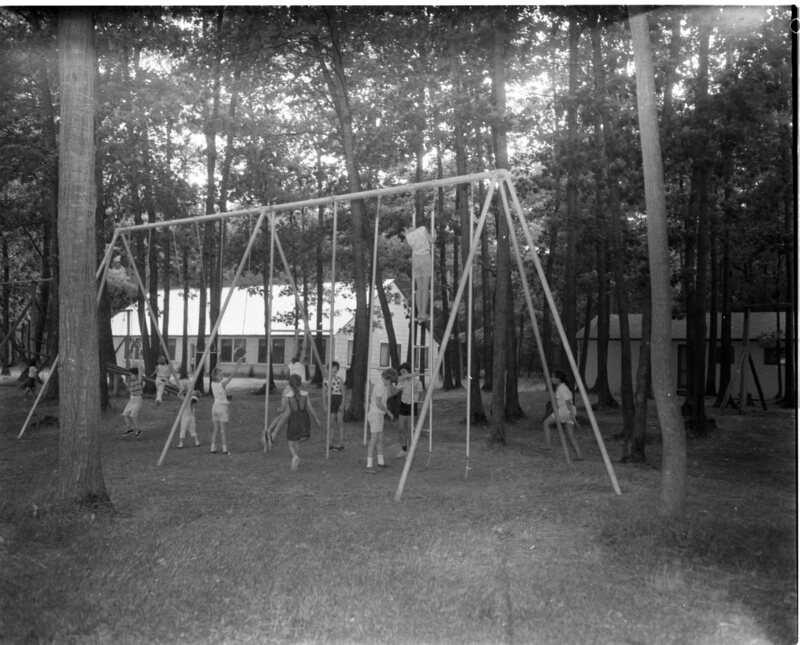 In a section of Ontario where summer camps, operated by a great variety of organizations, it may be quite a surprise to many North Simcoans to learn that the Society of Friends (Quakers) have just such a camp near Waubaushene. The most surprising thing of all, to this writer at least, is the fact that it has been there for 25 years! 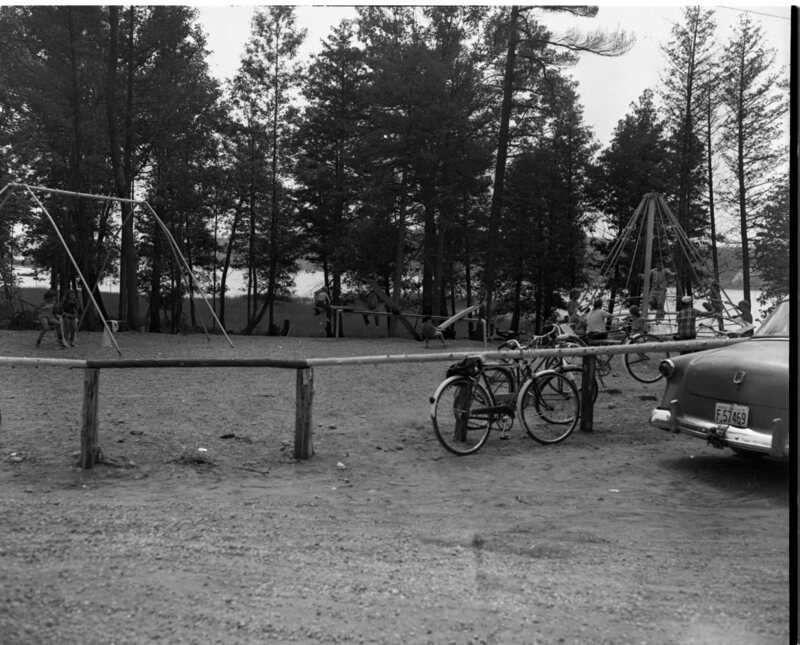 The site of Camp Neekaunis was purchased from the Tanners of Tannerville some 26 years ago and the camp is now capable of looking after some 50 or more children or adults during any one camp period. It operates three camp periods from the middle of July until the end of August, with Stirling Nelson as camp director. The campsite, comprising about ten acres, includes a portion of high ground from which the campers get an unobstructed view of Beausoleil Island, nine miles away. The property stretches across the CNR tracks to provide a sandy beach for swimming activities. The name Neekaunis is a fitting one, for in the Huron language it means the “meeting place of the friends.” Well appointed, the camp includes a large assembly-dining hall, a large cottage for the staff, and seven cabins. Excellent water is obtained by pump right from Georgian Bay. 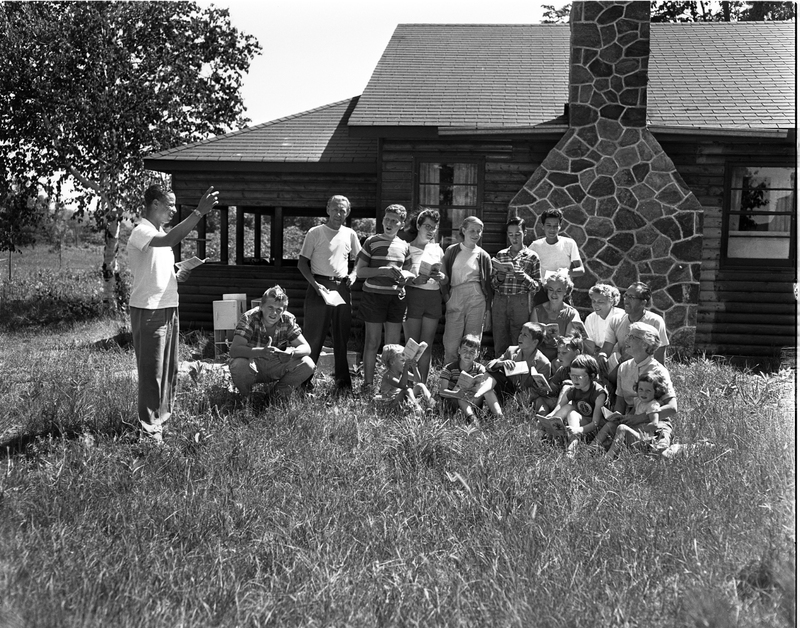 The above photo captures a sing-song at the camp. 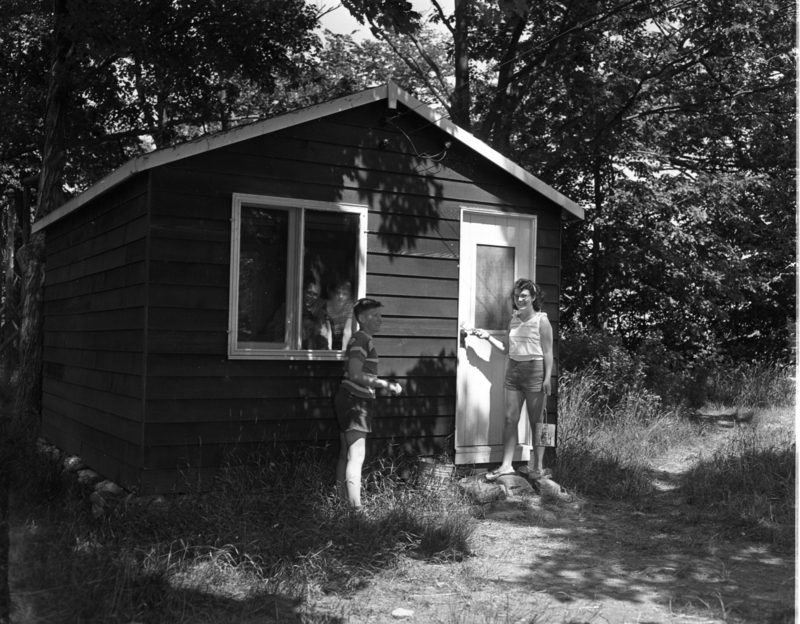 Everybody works at Camp Neekaunis, operated by the Society of Friends (Quakers) near Waubaushene. Calvin Nelson, left, of Niagara Falls, and Charlotte MacInnis, Hamilton spruce up one of the seven cabins while the young campers watch from a window. Playground equipment installed at Penetang’s new beach park gets plenty of use from holidaying youngsters. Swings, teeter-totters, and a circular Maypole ride were installed this year by Parks Board. Hot weather is bringing Penetang’s beach park into fuller use. 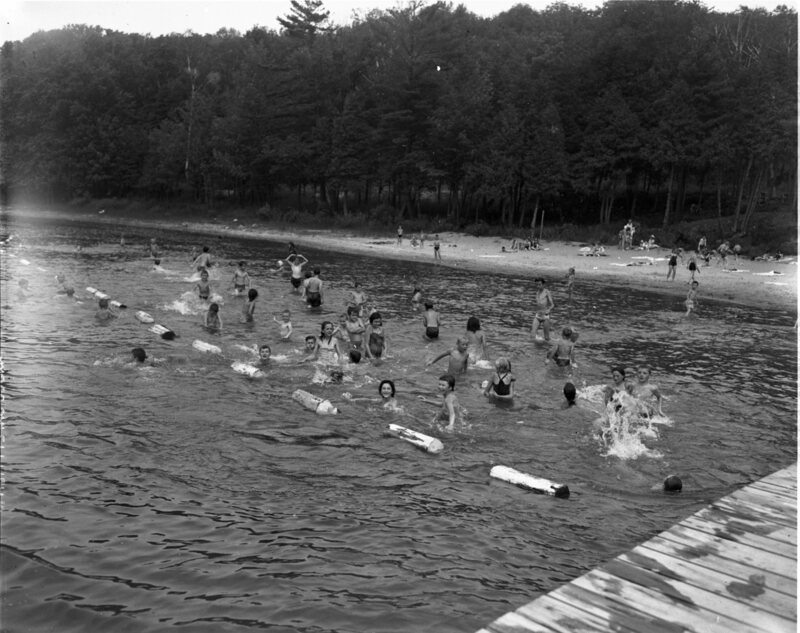 The float marked portion of the swimming area attracts many children who are unable to venture into deeper water. 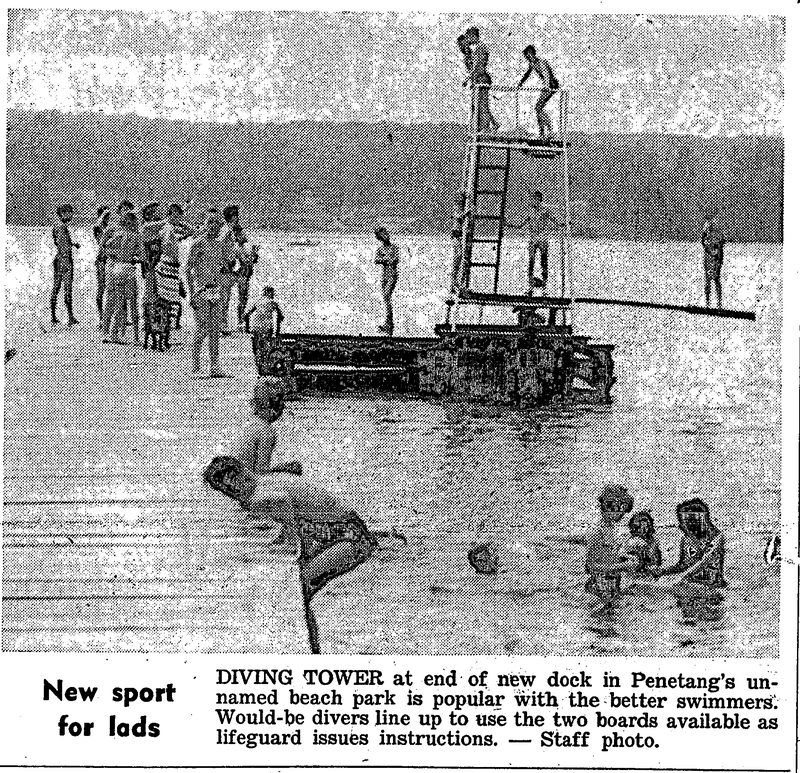 The area is supervised by Mrs. J. Puddicombe, the park lifeguard. 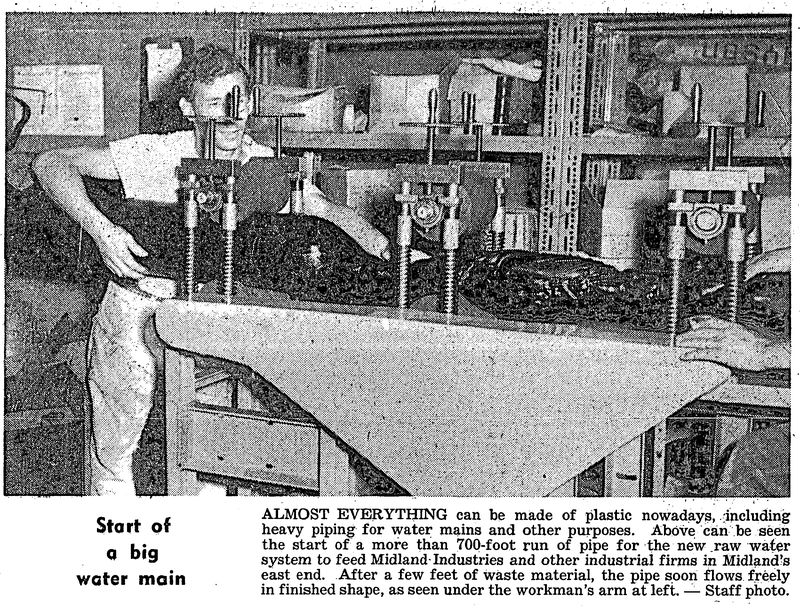 The County Herald headline from August 1, 1958; Reported Flip in Plans Causes Stir Over Marina. A report that the federal government had decided to locate the Midland Yacht Club marina at a different site than originally proposed, prompted a special meeting of Midland Chamber of Commerce directors Monday night. 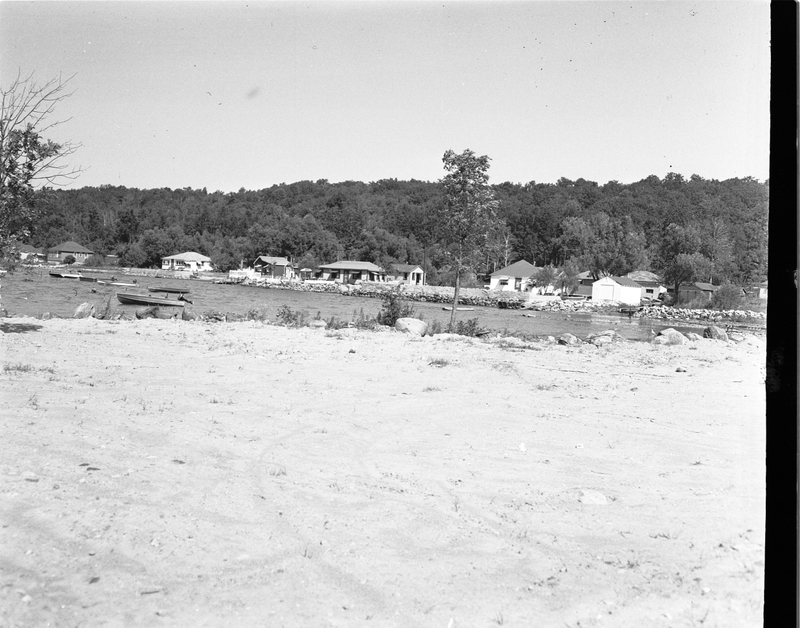 Secretary-manager R. B. Moffatt, in a memo, reported that the club had been informed a decision had been reached by the government “on the advice of certain local citizens” to locate the marina on the southerly shore of the harbor. 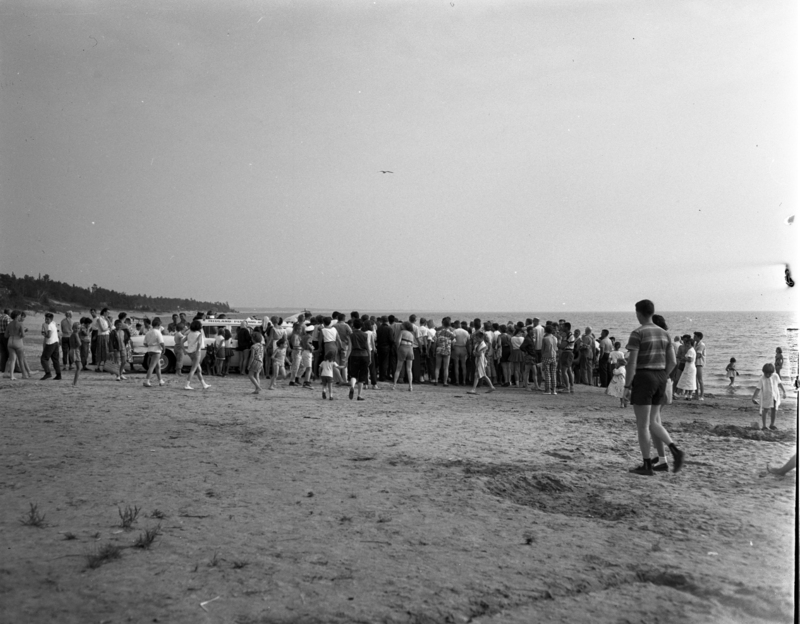 The location recommended by the yacht club had been at the westerly end of Midland’s harbor. He asked for instructions and the establishment of chamber policy on such a development. Chamber President Frank Bray said he could see no objection to the southerly location provided construction was of a nature to give proper protection to the boats. He added that the position of the chamber had been, and presumably still was, that the marina should be built somewhere, but that the chamber would want it built in the best and most logical location. It would be regrettable if a mistake was made as to location, he said. The Free Press Herald headline from August 6, 1958; Midland Police Smash Teen Theft Ring. Midland police believe they have broken up a gang of juveniles responsible for a crime wave which swept the town over the past week and the holiday weekend. The chief, Staff Sgt. George Wainman and Sgt. Ernie Bates are working on the case. In the past 10 days, the YMCA, Midland Public Library, and Pinecrest Products Ltd. were broken into; three residents had the tires of their cars deliberately punctured; $106.75 was stolen from four cars and a Toronto bus in Little Lake Park; a $140 camera was taken from a Toronto visitor’s car; gas was reported stolen from Murray Wagg’s boat in Midland harbor, and a car radio worth about $100 was taken from Boyd’s Service Station. A short-lived summer electrical storm Sunday afternoon turned a gay holiday picnic into tragedy when a bolt of lightning struck and killed 21-year-old Paul Hamelin at Penetang. Paul, with Urbain Moreau, in a small outboard boat, was starting for Beausoleil Island, with four companions in a larger boat, when the storm struck at about 1.15 p.m. They had just left the floating docks and had come abreast of the big concrete dock and about 200 feet out when the lightning hit Hamelin, who was riding in the front seat. Urbain Moreau, running the motor, was knocked unconscious and when he came to, found his companion stretched stiff in front of him. He later told his mother that he splashed water on Paul’s face and tried to get him to sit up before realizing his body and clothing were burnt. The Paterson freighter Prindoc, which arrived at Owen Sound from Collingwood recently, is expected to be laid up for an indefinite period, according to Owen Sound officials. It is believed that the lay-up is due primarily to the temporary lull in Great Lakes grain shipping. The vessel has a gross tonnage of 6,600, a keel length of 387 feet and a beam of 50 feet. Three ships are currently laid up at the CSL winter berth in Midland, with the arrival last week of the Westmount. Two other CSL ships, the Hagarty and Donnacona, have already been laid up several weeks. There is one ray of hope in the picture, however. J. G. Hendrickson, CSL manager in Midland, said the Lemoyne is being refitted for service again. The Lemoyne has been laid up at Kingston since June. Mr. Hendrickson also said there is some space available in the CSL elevator when the ships start moving again. “We’re at least keeping the rust off the machinery this year,” said an official of the CPR elevator at Port McNicoll. Last summer no grain was shipped in or out of Port for many weeks. This year the elevator at least had two ships in during July, although they were admittedly small ones. 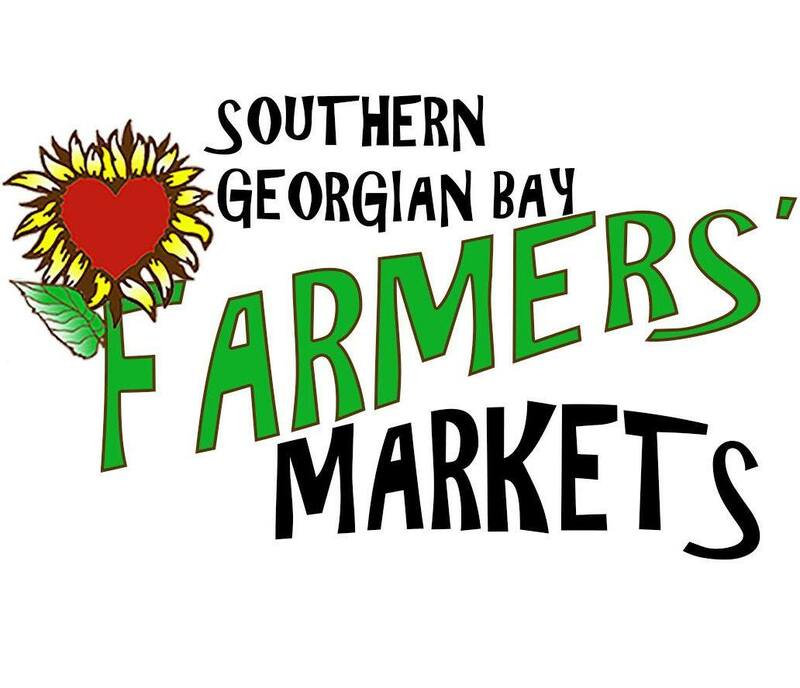 Lafontaine News – The Rawleigh dealer was in this area selling his products. A truck and crew were busy Wednesday renewing the white traffic line on the main road. Children are now picking the wild raspberries in the bushes. The planet Venus is seen now every morning about 4 a.m. in the east. Rosair Moreau makes large sales of new potatoes daily. Joe Mulie of Toronto was a Sunday guest of Mr. and Mrs. Mulie. Rosair Moreau is the first farmer that is ready to stook and thresh this week. Union of Electors is organizing to attend the New Brunswick congress about Aug. 30. Mr. and Mrs. Florent Marchildon and Roger Jakio of Toronto were the guests of Ed. Marchildon. Mike Jasson has moved to Midland with his family. He has been employed at the Name Plate for over a year. Albert Gignac of Preston, Ont., was visiting Mrs. Elie Moreau and Em Moreau, his brother-in-law. The bazaar is over and it has been a success. A thousand plates were served, two hundred more than last year. The Maurice Bros. sawmill will close for a couple of weeks. P. Toutant received a phone call from Midland Saturday, to say that his daughter, Mrs. Patrick Brunelle, was very sick. She is now in the hospital and Mr. Toutant will not return home for a few days yet. BIRTHS, — To and Mrs. R. D. Brooks, 339 Irwin St., Midland on Thursday, July 24, 1958, a daughter, Joyce Elaine. — Mr. and Mrs. Keith Wood are happy to announce the birth of their daughter, Lorna Mildred, at St. Andrews Hospital, Midland, on Tuesday, July 22, 1958, a sister for Cheryl. 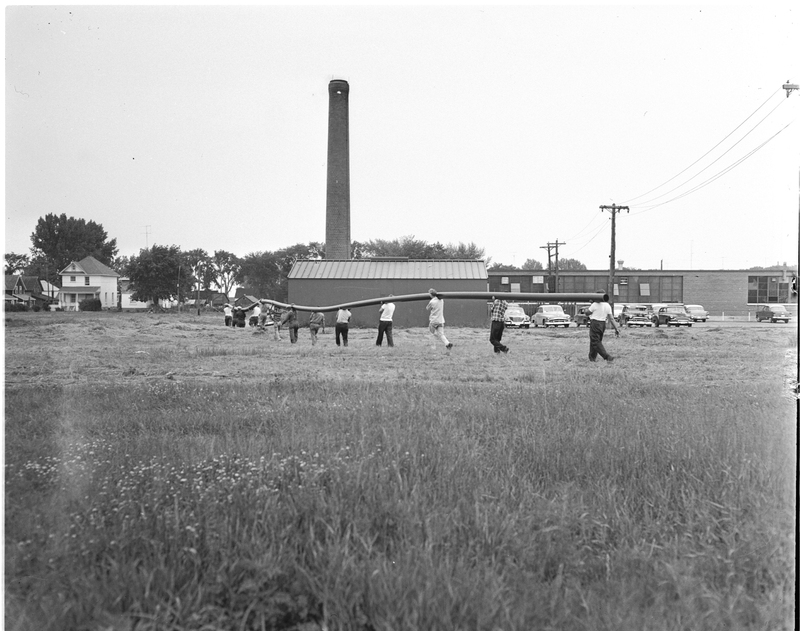 TEN YEARS AGO THIS WEEK 1948- Elmvale’s newly organized trumpet band made its debut at a sports day at Vasey. The band led a parade of athletes into the Vasey Park. * * * Archaeologist Wilfrid Jury, conducting excavations on the site of old Fort Ste. Marie, Midland, reported that diggers had uncovered the outline of the first building to be built at the fort. * * * Gloucester Pool Cottagers Association requested the Department of Game and Fisheries to set up a fish sanctuary in the Severn River waterway between Big Chute and Little Chute. * * * Deploring the lack of military training facilities in this area, Branch 80, Canadian Legion, Midland, requested a battery of the Grey and Simcoe Foresters (RCA) be established at Midland. The request was sent to Prime Minister W. L. M. King. * * * CSL officials announced that the S.S. Noronic would make three post-season cruises. On all three, the ship would make Midland a port of call. The first cruise was to arrive Sept. 14. * * * A deputation from Coldwater Board of Trade, consisting of I. G. Wylie, Lloyd Letherby and Keith Robinson had interviewed the Department of Planning and Development and the Board of Railway Commissioners in Toronto in connection with the establishment of a new industry in Coldwater. * * * Eighteen students at Midland High School were to receive Honour Secondary School. Graduation Diplomas because they had attained honor standing in at least eight upper school examination papers. For Sale – PET SKUNKS, deodorized, frisky and healthy. Write Mr. Pilon, 56 Poyntz St., Penetang. “We seem to have set some sort of a record at our information booth on King Street,” said R. B. Moffatt, secretary-manager of Midland Chamber of Commerce. “Certainly we have not had as many people there looking for accommodation in the past ten years, at least.” “Every bit of accommodation we had on our list was completely sold out, including hotels, motels, cabins and tourist homes,” Mr. Moffatt reported. In addition, many private homes not on the list were called in an effort to find some kind of accommodation for the visitors. Despite this, many families were forced to spend the night in their cars, Mr. Moffatt said. Evidence of things to come could be seen at Barrie by noon Saturday, as police struggled to keep traffic moving on Highways 400 and 27. Police said traffic was proceeding at a stop-and-go pace over a 40-mile stretch for several hours. One lady visitor, when she arrived in Midland late Saturday afternoon, said it took two hours to get around Barrie. 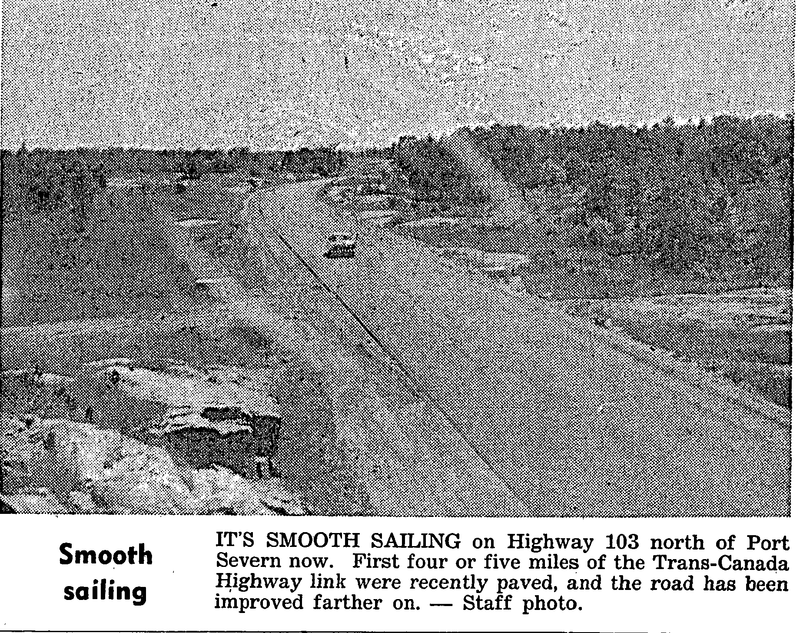 This used to be commonplace in the days before the opening of Highway 400 when traffic had to crawl through Allandale and Barrie on a busy weekend. In an effort to speed up the return flow to the cities on Monday, police were directing traffic onto Highway 93 Waverley to Crown Hill and all other available alternate routes. Waverley News— Mrs. Ames is spending this week in Toronto with her mother, Mrs. Lacey, who is quite ill. Barbara Anne and Russel Reynolds of Wyevale spent last week with their grandmother, Mrs. Clarke French, and also attended the vacation Bible school. Mr. and Mrs. Gerald Adams, Mrs. Douglas Adams and Gail of Toronto were visitors of Mrs. Wm. Adams. Cindy Brown of Toronto is spending some time with her grandmother, Mrs. George Brock. Mr. and Mrs. Eldon Reynolds and Dennis spent last Sunday with Mrs. Clarke French. 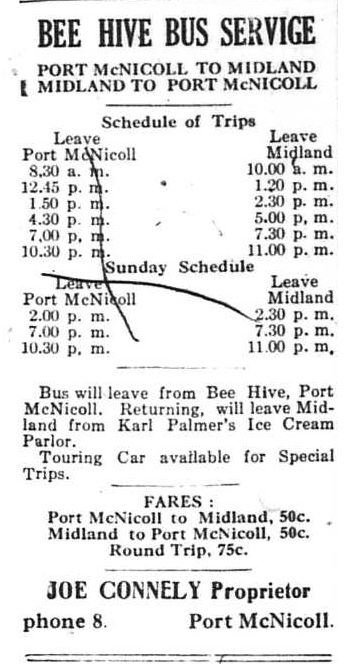 Miss Maysie Reynolds of Toronto holidayed with her parents, Mr. and Mrs. Art Reynolds. Mr. and Mrs. Ernest Cummings and Gail of Thornhill spent last weekend with Mr. and Mrs. Herman Trew and Clarke. Gail and Carol Tinney of Hillsdale spent last week with Mr. and Mrs. H. Hornsby. 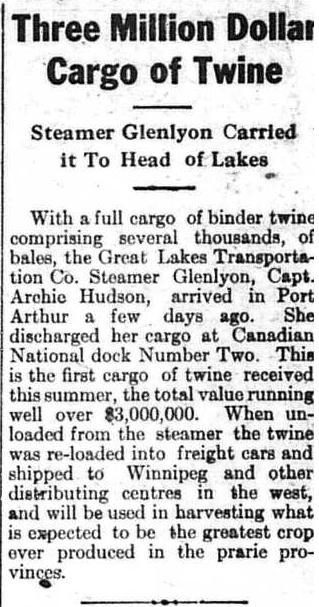 Mrs. Clarke French and Dougie were in Thorold visiting Clarke while his boat was unloading.